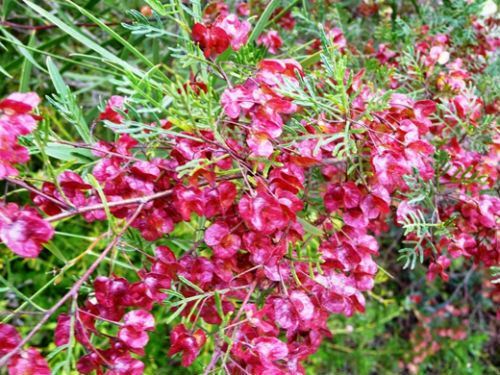 Over 50 Dodonaea (Hop Bush) species are native to Australia. Although reasonably common in the Australian bush few Dodonaeas are widely cultivated. This is a pity because many species have interesting foliage and colourful fruits. They belong to the Sapindaceae family. Dodonaeas have male and female flowers usually carried on different plants. Both male and female flowers are insignificant. The female flowers develop into 2-4 winged capsules. A hard-coated seed is held in each wing. Unfertilized flowers will produce capsules without seeds. Dodonaea boroniifolia has both interesting foliage and colourful capsules. Reaching a height of 2-3 metres this species has pinnate leaves. The leaflets are dark green, sticky with lobed apex. Each lobe has an unusual sunken gland. Flowering extends from May to December. The 4-winged capsules that appear after flowering are an eye-catching purplish-red. The dark green foliage contrasts with the capsules. Dodonaea boroniifolia has proved to be hardy and, once established, has low water requirements. Garden visitors often remark on the colourful capsules that are carried for many months. Prune lightly every so often to keep plants from becoming straggly. Dodonaea boroniifolia is widespread in New South Wales as well Queensland and Victoria. Propagation is by seed, best soak in hot water before sowing, and cuttings. We only propagate cuttings from female plants to maintain the colourful capsules.